5つ星のうち4.0Decent account of the WWII German Navy. 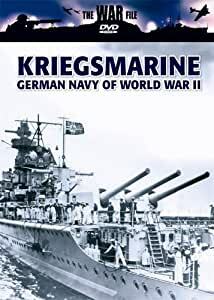 This DVD covers the strategy and actions of the German "Kriegsmarine" or navy during WWII and some decent discussions of strategy and ship design. The video begins with the situation at the end of WWI and the restrictions placed on the German Navy by the Treaty of Versailles. This is the "back story" and explains why the Germans approached the rebuilding of their navy the way they did in the 1920's-1930's as well as the creation of new ship classes such as the "pocket battleship". Really, the Germans had two competing traditions: the surface warfare school that tended to dominate thinking in all navies and championed the big guns of battleships, cruisers and to a lesser extent the aircraft on carriers while the other school, the submariners, focused on the strategic capability of submarines. In the event, it was the surface warfare school that won out and CinC Erich Raeder and his staff created Plan Z as the blueprint for rebuilding the German navy to contend with the Royal Navy of Great Britain once again. Their rebuilding plan assumed peace until the late 1940's and the outbreak of war in 1939 meant they were completely unprepared for war. In the event, the surface fleet they desired had little effect on the war while the submarine was the weapon that held the best promise for defeating Britain. It is clear that if resources had been poured into U-Boat design and construction (instead of investments made in big-gun surface ships), the Battle of the Atlantic may have had a different victor. It's a decent retelling of the naval war in WWII from the German viewpoint though not particularly brilliant. There's a lot of good video footage of German naval vessels including E-Boats which I thought was worth the price. I recommend this DVD to those interested with four stars. This is well done with ample period footage of the German surface navy. I thoroughly enjoyed it and salute the brave men on both sides who gave their lives. Mostly now forgotten but hey we live today because this happened. I like to review the opposition first but good scenes and explanations is this movie but strictly historical if you are into this. Video pretty good and sound as well but it ain't no STAR WARS sound track so be easy.